So, you have a kit? Every time that I build a The House of Miniatures™ furniture kit I think about the first time I opened one of these boxes. And I think about the many experiences I’ve had building THoM kits. This article is not about the How or the Why, but about enjoying the experience. My very first build was shared with my grandmother. I wasn’t very young, about 14, but I was super excited. So, it was a calming, steadying influence to have a patient, experienced crafter with me. Previous to that first furniture kit I had built plastic models of planes, cars, and ships (including two versions of the USS Enterprise), but I had little experience with wood. Gram had experience with wood glues and stains, which I did not. We both learned a few things. By helping kids to have a great first experience with miniatures you will be giving a child a creative outlet and helping to spread the joy of your experience at the same time. 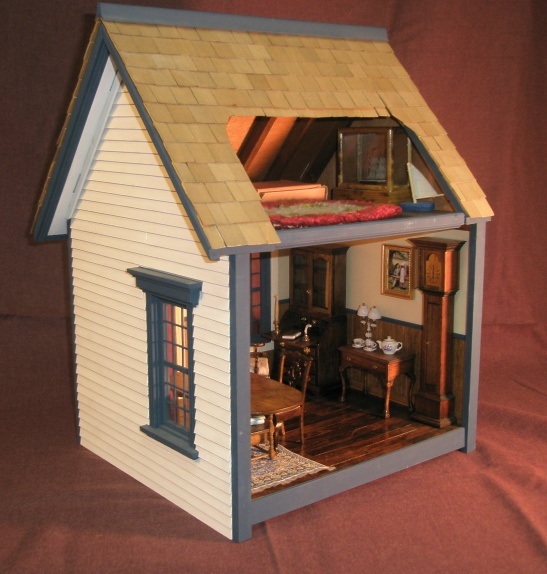 Sometimes you have a dollhouse or room setting that needs a special “focus” piece. The setting will tell you what it needs and also inform the style of the build. Colonial? Country? Victorian? Each setting is different and THoM kits can be custom built for any purpose. The instructions are great for helping you to see how things are “supposed” to go together. But you’re the artisan. Figure out what is missing and create it! Other times you just need to stretch your skills. Start with the instructions, but then soar beyond. Make something that you can talk about. 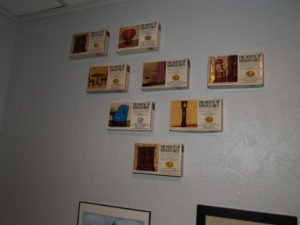 Not so you can brag, but to share the enjoyment and your interest in a time period or style. My grandmothers each had a number of family heirloom antiques. 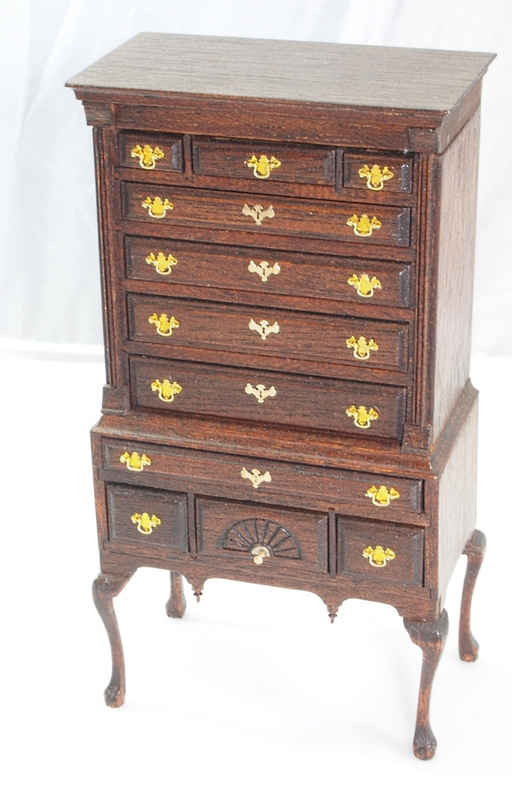 Thinking back I recall the styles and the finishes and the craftsmanship. To recreate one of those furniture pieces (since none of them passed to me) would bring back great memories, both in the building and in the viewing. 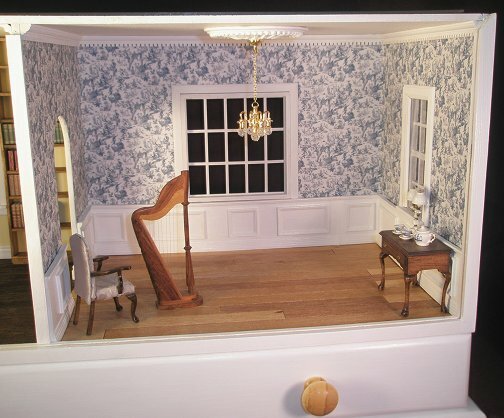 When you see photos of the Thorne Rooms you realize what can be done with 12th scale miniatures. Mrs. Ward-Thorne set out to record historical settings, and succeeded spectacularly. In my imagination I could create something like that… okay, my wildest dreams. Just because I could never equal museum quality doesn’t mean that I couldn’t make some very educational or entertaining period room settings. I’d like to recreate a room from a Jane Austen novel, for instance. Perhaps the drawing room from Kellynch? One thing I have done is to create my own story and then fill a roombox to go with the narrative. For instance, when I was covering a little armchair with some silk fabric my daughter found, I got the idea for an old sea captain’s quarters. That thought led to a story and a diorama featuring an ancestor of mine. So now I have a roombox that will someday be an ell to a house near Boston in 1790, the office of a seafarer turned shipping agent, complete with maps and charts and a hand-thrown tea service. Amazing fun and a novella in the making! 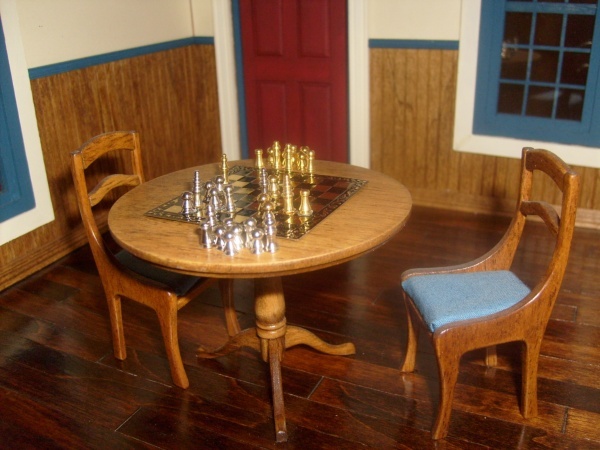 This is a little Hepplewhite table and chairs with a chess game in process. I built it for a club function called a “make”. I drew a name, built something for the person, and shipped this set off to them. Someone else made a “game” item and sent it to me. 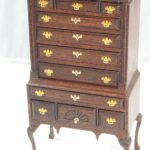 When I built this I posted an article on my old web site, Maine Miniatures. The state chess club saw it and asked if they could make my post into an article in their newsletter! It helped that I took the chess board layout from a game where Bobby Fisher was about to lose. The chess club got a kick out of it. If you don’t belong to a local club there are many online. The forum attached the NAME was where I found my first one. 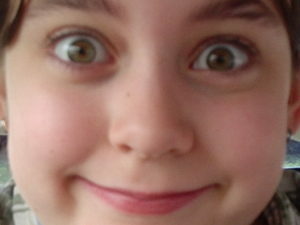 I found another through the forums associated with Greenleaf. Sometimes you just want to make some warm cocoa, sit at your workbench on a rainy day, and do what your heart tells you. That’s totally awesome, too. This hobby is about life. Sometimes we give, sometimes we feed our own souls so that we have a place from which to give more later. Bonus: turn the empty boxes into wall art for your creative space! All I do is run a pushpin through the bottom of the box into the wall and then put the cover on. One pin holds it, and they don’t have to be straight (unless you’re a little OCD, like me). What kind of projects have you done with THoM kits? Add to my list by posting in the discussion below.